opinion It was a cold, rainy and blustery last Friday morning when I roused myself out of bed to get the day started. The sky was grey, my feet were cold and it took a cup of hot coffee before my brain started functioning at a normal level. And yet, as I prepared for the day ahead I felt an aura of anticipation approaching that of a Christmas morning, or perhaps Easter. The presents that would be opened that morning were expected to be glorious. 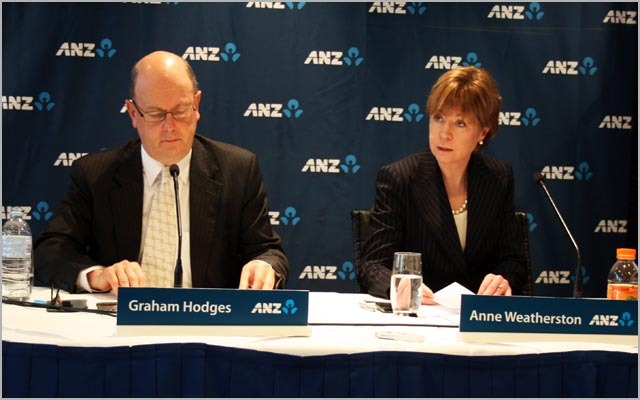 For the first time since her appointment in November 2009, ANZ Bank chief information officer Anne Weatherston had made time to make public the bank’s IT strategy. For the first time in several years, I thought, Australia’s IT industry would get some insight into what precisely the bank’s technology strategy and roadmap consisted of. And the question of what that strategy entails is not a trivial one. With some 6,000 IT staff (including a massive facility in India’s Bangalore), an annual IT budget of around $1.5 billion and systems which affect millions of Australians, every step that ANZ takes with regard to its technology roadmap will send shockwaves throughout the industry. We have only to examine the influence that the technology leaders of fellow banks wield to see this in action. Bank CIOs like Jeff Smith (with Suncorp’s agile development processes and BYO computing philosophy) and Michael Harte (with CommBank’s massive core banking overhaul) have become larger than life figures in Australia’s IT industry over the past half-decade. Their every move is watched and they are breaking new ground. However, like a child who awakens on Christmas morning to find that his destitute parents have filled his stocking with Weet-Bix, ANZ’s briefing on Friday was destined to disappoint. Throughout the lengthy briefing, the bank offered little beyond tantalising glimpses of what its technology strategy will entail over the next decade; instead using a series of platitudes and motherhood statements like “customer-centricity”, “critical enabler” and “organic network” to avoid giving any real detail about its plans. What we do know about ANZ’s technology strategy through 2017 (its strategy through 2012 is mostly complete, not that you’d know) currently consists of dribs and drabs. We know the bank is not pushing ahead with a core banking overhaul project, unlike all of its rivals (Westpac’s not making the plunge immediately; but has acknowledged it will take place in the long-term). We know the bank is continuing to focus on using technology to support its push into the Asia-Pacific region. We know ANZ has upgraded its mainframe platforms and is pushing heavily into virtualisation, that it’s upgrading its customer-facing platforms (including Internet banking), as well as specific banking applications such as its Transactive cash management platform. We know that it has recently embarked on a desktop virtualisation project and it is continuing to standard on Oracle’s PeopleSoft ERP platform. We know its recent $500 million Optus contract is seeing its internal network upgraded. However, in fact, we knew most of this before last Friday’s briefing. What we don’t yet know would fill a country mile. We don’t know, for example, to what extent ANZ is following Westpac and CommBank in building its own private cloud computing infrastructure. We don’t know how its internal network infrastructure is being upgraded, or whether it is moving down the path of internal videoconferencing and softphones, again, as CommBank is. We don’t know what technology that desktop virtualisation project is based on. We don’t know how ANZ’s internal collaboration architecture (think email, authentication and so on) is evolving. We don’t know much about how ANZ is using software as a service platforms (although we do know Salesforce.com is being used in its insurance business). We don’t know how the replacement of some 50,000 RSA SecurID tokens is playing out inside the bank, or how its security architecture is evolving. We don’t know precisely what the future of ANZ’s innovative goMoney app is, or how successful it has been, and we don’t know what the bank is planning in terms of near-field communications, the integration of its E*Trade brokerage business, the future development of its mobile software, and so on. We don’t know what the mix of ANZ’s IT workforce is between Bangalore and Australia, how that mix is changing, and what that has meant for the bank’s relationship with its outsourcers. In fact, we don’t know much about who those outsourcers actually are. Now there are two things to realise here. The first is that the bank’s CIO Weatherston and its deputy CEO Graham Hodges (who was also at the briefing) did discuss almost all of these areas during last Friday’s briefing. However, they did so at such a high level that no specifics were mentioned. This makes it impossible to know much about what ANZ is really up to. Secondly, of course is the fact that the bank is under no obligation to go into this level of detail about its operations in public. In fact, it may be to its advantage to keep quite a lot under wraps, so that its competitors can’t match what it’s doing. However, I don’t believe that that is what is going on here. After having met Weatherston, and asked the CIO a number of questions about her bank, I get the impression that the bank is facing a much wider problem: A lack of strategic thinking. Long-time banking IT commentator Charis Palmer wrote about ANZ in June that the bank lacks “technology vision and leadership”. I couldn’t agree more. All of the things which we do know about ANZ’s technology operation right now indicate that the bank is pursuing a purely tactical approach to IT strategy. It’s moving with the demands of its business, implementing systems where it has to, and cutting costs where it can. In some areas — such as with the groundbreaking goMoney app — the bank clearly has small bands of smart people who are driving strong innovation within its operations. But the majority of ANZ’s technology work displays the lack of a guiding hand at the wheel. The rudder is skewing off-course. In many industries, at many tiers of leadership, this wouldn’t be as evident as it is with ANZ. But we have many visionaries to compare Weatherston to; chief among them Suncorp’s Jeff Smith, CommBank’s Michael Harte and Westpac’s Bob McKinnon, who’s now on his second round of major bank IT leadership efforts. Weatherston said last week that ANZ’s challenges were different from those of CBA. And she’s right — some of them area. But so many of them, especially infrastructure problems, are common to every large bank in Australia. And there is no evidence that the CIO realises how far ANZ is gradually falling behind. It is not in 2011 that ANZ will fall behind rivals like CommBank and NAB when it comes to its core banking strategy. It will not be in 2012 or even 2013 that the bank falls behind when it comes to the technology which its staff use internally, or its development processes. It won’t even be in 2014 that the bank will begin to feel how slow and cumbersome it is becoming when compared to rivals. But it will be in 2015 and beyond, and by the time 2020 rolls around, and Australia’s banking sector has accelerated to light speed and is facing a wave of new, Web 2.0-style competition from non-traditional players with no legacy infrastructure, ANZ will be in hot water. It is to meet this level of challenge that core banking systems and other aspects of internal infrastructure are being rapidly upgraded at its rivals. It is this level of strategic thinking which ANZ is lacking. Because the truth about banks is that they don’t simply use technology to support their businesses. Fundamentally, the provision of technology *is* their business. For those who doubt the veracity of this statement, I encourage you to examine the success of online payments giant PayPal, which is beating the banks at their own game on the Internet. There are no sharks circling off the edge of the beach for ANZ right now. But there is a cluster of deadly predators on the horizon which will eventually eat the bank alive. Michael Harte’s got a pair of binoculars and a sniper rifle trained on the blighters right now, and NAB and Suncorp are planning to dive bomb them with a couple of helicopters equipped with rocket launchers. But Anne Weatherston … is still sunbathing on the sand with a martini in one hand and an Agatha Christie novel in the other. I am not sure what this writer is on about. Other than CBA most of the other banks dont have much leadership in technology or a strategy. They all claim they have one. But all they have is bloated architectures of legacy and a promise to nirvana. For so many times all these local CIO’s promise change and transformation delivering little or nothing. Its good to talk about Jeff Smith and Michael Hart who are actually a very rare breed of overseas CIO’s who have given some imagination and dynamism to the market. Very few IT leaders are of that league in the local market. So why hammer Weatherstone ? This report seems to have no balance and has no solid research behind it. To ask her to name the outsourcers and expect her to answer it shows the level of incomeptence of the journalist. Which CIO in their right mind will let the cat out of the bag by saying they have decided to go to a particular vendor ? Wouldnt they just kill their negotiation position. What we have is very low quality of reporters in this country. Hey rupert where are you ? Time to leave London and come here!!. Maybe the reason for the lack of information is that weatherson doesnt know the answers herself. Internal rumblings with the anz IT ranks would suggest that this is the case. The briefing on Friday would seem to suggest this is somewhat true. Several specific questions were asked (such as what technology was behind the desktop virtualisation project) which Weatherston didn’t have quick answers to. Of course, at her level, overseeing some 6,000 staff, you wouldn’t expect her to know everything. If you had met me you would know that I don’t drink and I have never read an Agatha Christie in my life but when did reality and fact come into reporting. hope you’re well! Thanks for conducting the briefing last week — I appreciate that you guys went to a lot of effort with it. If it’s true that you haven’t read any Agatha Christie then I would encourage you to test her out — I’ve read quite a few of her novels recently and enjoyed them a great deal ;) But in any case, it was a metaphor. If ANZ is prepared to release more detailed information about its plans (as CommBank, Westpac and Suncorp have), then that opinion may change, depending on what new facts come to light. I retain an open mind and will be interested to see how you guys go over the next couple of years particularly. In addition, I’m still keen to find out more regarding certain aspects of the briefing — such as the desktop virtualisation strategy. well i guess here lies the problem. A reporter is better to report while the readers focus on forming their opinions. Readers who read the above article might form the opinion it was written well before the reporter arrived at the place to listen to the briefing. It looks like he wrote it after santa gave the present and wasnt happy with it. It must have been a bad christmas! !.